become unattached next to the kitchen sink in our Trakka motorhome. be the time to see about getting the tap fixed. We just wanted to drop you a brief note to thank you for the work you have done on our Lupara motor home. As you know, our first contact with you was a rather panicked phone call from Dubbo, where our motor home had developed a number of quite serious window and body leaks. On the recommendation of several other Campervan and Motor home club members, we contacted you and you were able to fit us in at very short notice. You fixed the leaks – as well as a number of other nagging problems – in half a day and at very reasonable cost. We have since been back to you for a couple of unrelated issues, the most recent of these being a show stopping problem to a piece of custom mechanicals that nobody in our home city would touch!! As we have come to expect, you again fitted us in with almost zero notice and did the work both quickly and to our complete satisfaction. As well as being thoroughly professional, you and your team are friendly, polite and go-out-of-your-way helpful in a way that has surprised people whom are used to city repairers. So far, we’ve driven almost 1,400 km to have you maintain our motor home, and we don’t regret one kay of it. In fact, in future we will plan our trips around when we need to be in Strathmerton to have our work done. As you can probably tell, we’re now big fans and, along with your many other satisfied CMCA customers, will recommend you to anyone who needs work done to their motor home or fifth wheeler. 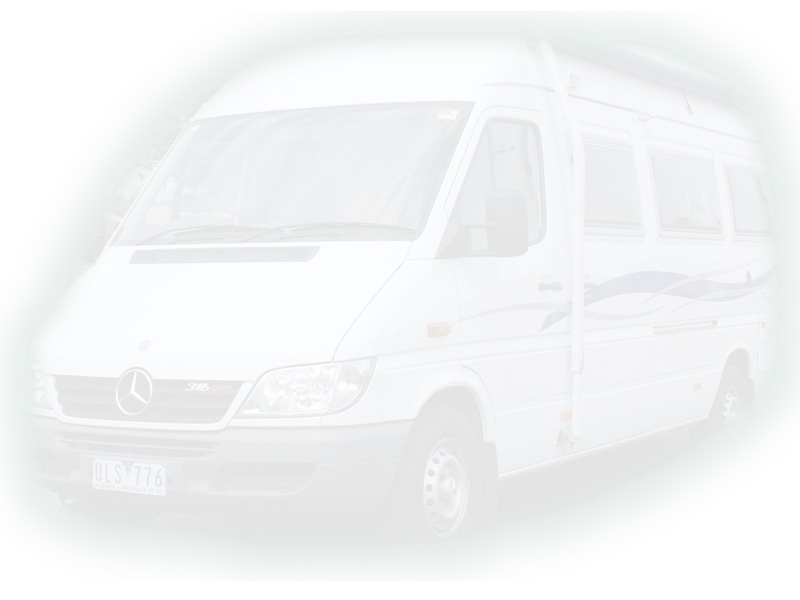 We purchased our Mercedes Sprinter Diesel Motor home from Murray Valley Motor Homes approximately 12 months ago. Since then we have found that the backup service and advice has been without fault. On our travels we are often asked our opinion on the layout and performance of our motor home and without hesitation we would recommend the quality and thoughtfulness of the fit-out along with the recognised name of Mercedes. 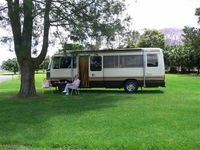 The staff of MVMH has always provided a professional and friendly approach when contacted and the small town of Strathmerton sports a bakery, pub, café and quaint bric-a-brac store and even a small caravan park to keep a customer busy while the motor home is serviced. We have previously owned another make of motor home and believe that we are experienced and discerning in this choice of vehicle – it rides well, is powerful when necessary, economical on diesel fuel, easy to park and turn, and instils confidence in all aspects of safety. As you can see from the pictures I've sent to you, the Motor home is still in good nick, .. as good as new .. no doubt due to the fine workmanship that has gone into it in the first place .. Teething-problems ? .. very few and you helped us to solve those with competence and we thank you for your expertise, assistance and after-sales-service . You can also see, that our Motor home gets around a bit and absolutely trouble-free .. of course we get it serviced at regular intervals and look after it .. Daryl I have to tell you, it grows on us more and more ( if that's possible ) every trip we do and we wouldn't be without it .. we made the right decision to get this Motor home instead of a Holiday cottage , it allows us to change the scenery ( and the climate ) whenever we feel like it .. and .. even at today's fuel prices, it's a heck of a lot cheaper ( 13-14 lt / 100 km = 20-22 mpg .. not bad eh, for a near to 5 ton. 4 lt / Turbo-diesel M' home ) than the upkeep of a Holiday-house .. and if we run over Budget, we stop for a couple of days at a nice Beach (.. Forest .. Village .. Mountain .. whatever. ) and carry on , when when our income has caught up with our expenditure .. completely controllable ! Daryl, Lisa and staff of Murray Valley Motor Homes converted our Denning Coach into a beautiful motor home in 2004 and we love it so much. We have nothing but praise for these guys for doing such a great job, the workmanship was brilliant, nothing but quality products were used. The electrical system (the heart of any good motor home) is, innovative and practical as well as simple to use. We highly recommend this business to anyone contemplating building a motor home or renovating and existing one.